Nonostante la fitta nevicata che finalmente è scesa sul Tarvisiano, oltre 130 bambini provenienti dalle Scuole Elementari della Valcanale sono stati accolti dai maestri della scuola sci Evolution3Lands. Tutti i partecipanti hanno potuto gioire delle varie iniziative ed attività in programma per l’occasione: lezioni gratuite di sci alpino, sci nordico e snowboard, discese con le fatbikes, e poi balli di gruppo e “trucca-bimbi” grazie al coinvolgimento del gruppo Gioca Feste. Abbiamo dato molta importanza alla “sicurezza in pista”, spiegando anche ai bambini l’utilizzo di ARTVA, pala e sonda e facendo loro provare ad utilizzare questi attrezzi attraverso una caccia al tesoro. La buona notizia è che oltre il 50% dei bambini sono bambini che non avevano mai visto la neve e mai fatto sport come sci e snowboard. L’evento WSD2017 è stato promosso sui canali Social (Facebook, Instagram principalmente) di Evolution3Lands attraverso post riguardanti il WSD2016, condivisione di post di @worldsnowday e di notizie specifiche riguardanti l’evento. L’evento è stato anche condiviso sui giornali regionali, locali e da notiziari online. Durante l’evento WSD2017 abbiamo utilizzato il Toolkit, fondamentali per un evento di tale livello: gazebo WSD - AUDI, pettorali WSD, pali da gigante ufficiali WSD - AUDI, diploma WSD con firma ufficiale del Presidente Gian-Franco Kasper, striscioni e gadget FIS WSD. Evolution3lands vuole ringraziare di cuore l’organizzazione, i maestri ed i volontari (Ski College Bachmann Tarvisio) per l’entusiasmo e la serietà dimostrate. The snow has arrived and enriched the magic World Snow Day! Lots of children came to the slopes of Tarvisio to enjoy themselves, sports and games. 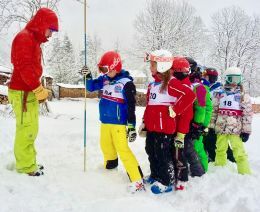 Despite the big snowfall, more than 130 children from Valcanale Elementary schools were welcomed by the Ski Instructors of the Evolution 3Lands Ski and Snowboard School. All of the children enjoyed the events and sports activities planned for the day: Nordic, Alpine skiing and snowboarding free lessons; going downhill by fatbikes, and then group dancing and face and body painting thanks to the Gioca Feste Group. Great importance was given to the safety on the slopes, teaching the children how to use the ARTVA, the avalanche probe and the snow shovel, giving them the possibility to try and use the equipment as a treasure hunt. Great surprise was that more than 50% of the children had never seen the snow before or practiced any winter sports activity, such as skiing and snowboarding. Children themselves were the only protagonists of the event; they lived this experience as a game and had fun; they found out what the White Circus can offer them, learnig how to move there safely. The WSD2017 event has been promoted on the social networks (Facebook, Instagram, …) by the Evolution 3Lands by means of some posts about WSD2016, sharing @worldsnowday posts and specific information. The event has also been shared on local and regional newspapers and TV news. 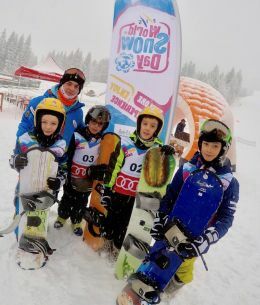 During the WSD2017 we used the Toolkit, essential requirement for such an event: WSD – AUDI gazebo, WSD racing bibs, WSD – AUDI Giant Slalom official poles, WSD certifications signed by President Gian – Franco Kasper, FIS WSD banners and gadgets. At the end of the day the children were given angel wings, hot chocolate and tea, gadgets and gifts by the instructors of the Evolution3Lands ski school. The Evolution3Lands would like to give thanks to the organization staff, the ski instructors and the .voluntary people (from Ski College Bachmann Tarviso) for their enthusiasm and reliability. The big snowfall and the difficulties in preparing the games and setting up the activities have not stopped the positive results of the event. The FIS World Snow Day has also been possible thanks to the support of a group of sponsors and partners who contributed to the success of the event. We would like to give thanks to Promotourism FVG, Alte Hutte Restaurant, Rentaski Valle Verde, Lussari Sport, Arteni, Banca Credifriuli, Evo Hutte and Acqua Dolomia, Silvano & C. Volkswagen cars and the applicant Alpine Guide Enrico Mosetti. The Evolution3Lands Ski and Snowboard School is very delighted with the result and is already thinking about the setting up of the eighth edition promoted by FIS all over the world.